COLQUITT, Ga. — The National Weather Service in Tallahassee confirms that an EF-1 tornado with max wind speeds of over 100 mph tore through Colquitt County on Sunday. 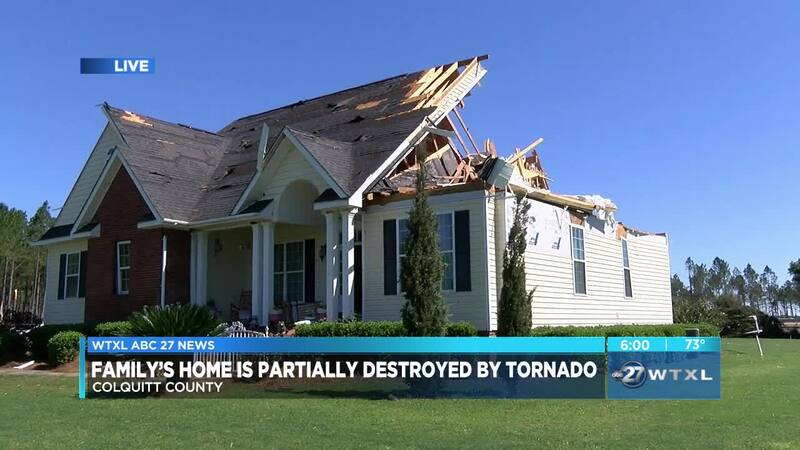 Weather officials say the tornado touched down just west of Tallokas Road in Colquitt County, damaging a home and some trees. The twister then continued northeast where it damaged a second and third home, snapping trees along its path before lifting north of S.R. 133. For the second time this year, a tornado has hit our area. People that had home damage say they're waiting for insurance adjusters to assess the damage. The Chavez family, who's home was damaged by the E-1 tornado, is one those families. "10 years to build all this and then boom, 30 seconds blew it all away," saud Abraham Chavez. Sunday, a line of storms tore through Colquitt County, leaving a path of destruction. The Chavez family losing years of memories, now questioning if they'll rebuild. "I'm the first person to live in this house and I really loved it," said Maria Chavez. The radar confirmed tornado knocked down trees in the Chavez's yard, and tore part of their roof off. Maria Chavez was the only one home at the time of the storm. She says the event was so quick she didn't have time to react. "I ran to the stairs and I prayed for like 10 to 15 seconds, then It stopped shaking the house and then I went outside and saw this mess," said Maria. The family says they are lucky more people weren't home at the time and their mother wasn't injured. "Saturday, I had my little girl here," Abraham explained. "We were all having nice family reunion and for it to all be blown away on Sunday, it's wild ... Everything happens for a reason I guess." They sau it will take at least a week to clean up all the trees that fell down in their yard and they are not sure if they will need to rebuild their home from scratch. 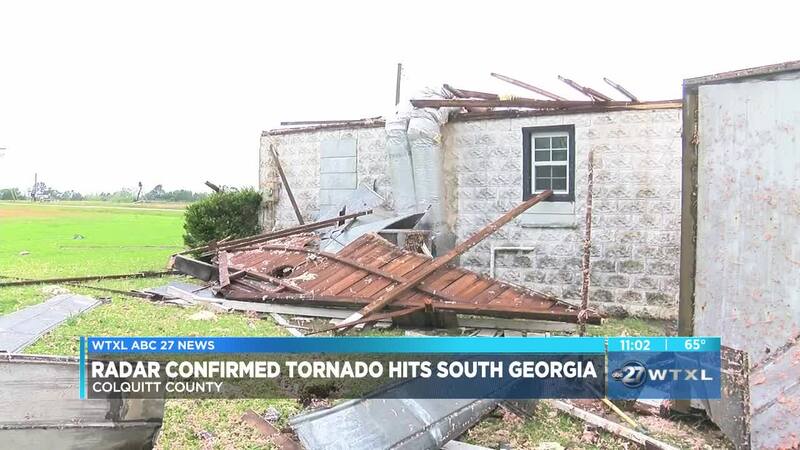 Another round of severe weather passed through the area causing damage once again in South Georgia. Power lines, tree, and debris cover parts of southeast Colquitt County after a radar confirmed tornado hit the area Sunday. As of Sunday night, Colquitt Emergency management says there have been no reports of injuries, some homes however, took a beating. On Tallokas Road near Plymel Road, several homes were destroyed or had significant damage. On Gibbs Road, one home was destroyed with the roof completely gone and the inner workings of the house spread across the yard. One man was home at the time and he says he is lucky not to be injured. "First time I have ever experienced something like that. I was just sitting there watching a movie waiting for the power to come back on, and then all of a sudden it was 'po po bam,'" said Jerome Mcbride. "I already have another place to go, so its all good, so we will come back and try fix this up and keep moving.